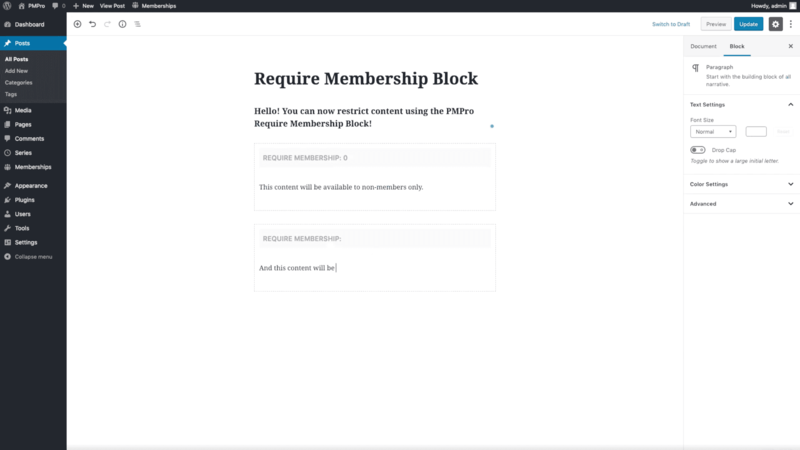 We’ve added a Membership Block for use with the WordPress Block Editor. This block will allow you to restrict access to nested block content for specific Membership Levels or for non-members only. This block is only available if you are using the Block Editor in WordPress v5.0 and higher. To use this method of restricting content, you would insert the “Require Membership Block” into your post or page content. The block has a multi-select box in which you can choose which Membership Levels should have access to view the nested block content. If a visitor or user accessing that post does not have the required access, the entire area of content will be hidden. You can place multiple “Require Membership Blocks” in the same editor with different membership requirements based on your site’s needs.